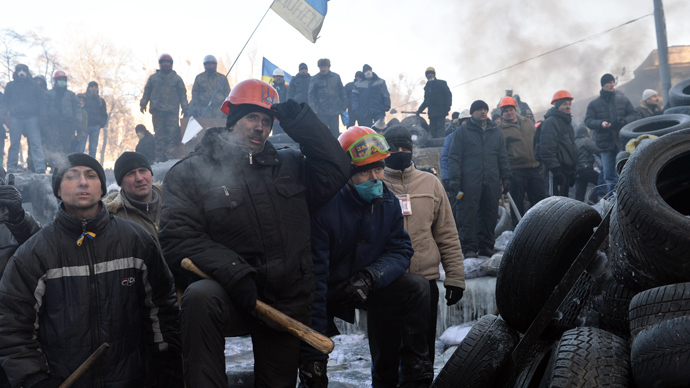 Clashes have resumed in central Kiev, following a tense ceasefire. Rioters are burning tires and hurling firecrackers and Molotov cocktails at police. There are reports of injuries. In a separate incident, a police officer was shot dead in Kiev on Friday night. Witnesses heard the shots and saw two people running away from the scene, Unian news agency reported. The victim lived near the Berkut living quarters. Meanwhile an explosion went off near the police station in Cherkassy, central Ukraine. Seven windows were reportedly broken, according to Espresso.tv. There are no injuries reported. Police are responding to attacks with rubber bullets and flash grenades. Rioters have started at least 10 new fires on Grushevskogo Street, with protesters actively adding more car tires and fuel to the flames, Unian news agency reported. Police forces have lined up directly across from the rioters, keeping calm and periodically lighting up the area with powerful floodlights. There are currently about 1,500 people present on Grushevskogo Street, including both rioters and police officers, according to Unian. Two ambulances have arrived at the site of the clashes. RT's Alexey Yaroskevsky reported that people on the streets are facing severe weather, with temperatures expected to drop to -30 Celcius overnight. In the meantime, the opposition said the civil crisis in Ukraine will be very difficult to solve without western intermediaries. “We have a social crisis in our country, not a political one. And we discussed ways out of that crisis with our European partners. I can clearly state that it will be very difficult to find a way out of this crisis without our western partners,” Batkivshchyna opposition leader Arseniy Yatsenyuk said after a meeting with the European Commissioner for Enlargement, Stefan Fule. Some experts believe protesters are trying to force the issue. Meanwhile, US Secretary of State John Kerry once again confirmed Washington’s support for Ukrainian protesters during his speech at the World Economic Forum in Switzerland. 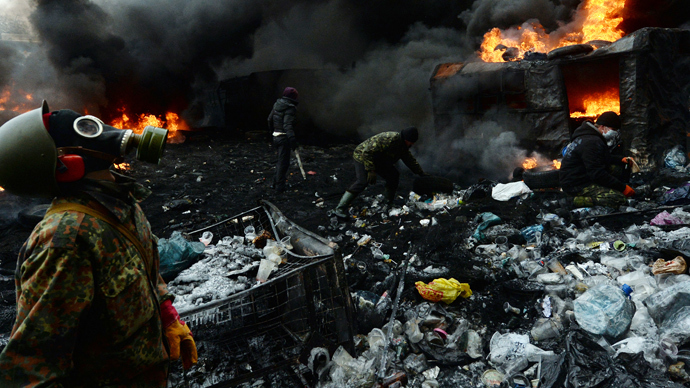 Kerry said the US is working with its allies and top Ukrainian officials to end the violence. “We are working with our partners to press the government of Ukraine to forego violence, to address the concerns of peaceful protesters, to foster dialogue, promote the freedom of assembly and expression,” he said. Earlier on Friday, Yanukovich promised a government reshuffle and amendments to the anti-protest laws that triggered the violent clashes in Kiev. "We will make a decision at this session [on January 28]. I will sign a decree and we will reshuffle the government in order to find the best possible professional government team," Yanukovich said on Friday, as quoted by his press service. In return for rioters leaving Grushevskogo Street - the epicenter of the unrest - Yanukovich on Thursday offered the release of those detained during the riots and mitigated penalties for protesters arrested in clashes. On Friday, he confirmed his readiness to pardon all protesters involved in the riots, as long as they have not committed grave offenses. A total of more than 100 people were detained following mass riots in the city, Kiev authorities stated on Thursday. Hundreds have sustained injuries. Ukraine’s Ministry of Internal Affairs said about 256 police officers have been wounded, 100 of them hospitalized. 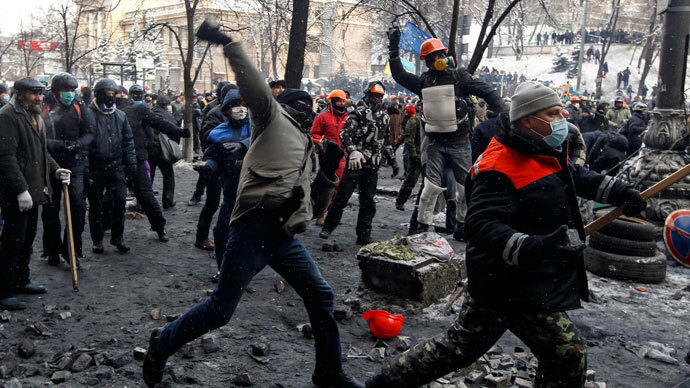 Meanwhile, riots have been spreading to other cities, mostly in western Ukraine, with protesters seizing local administration buildings and demanding governors’ resignations. 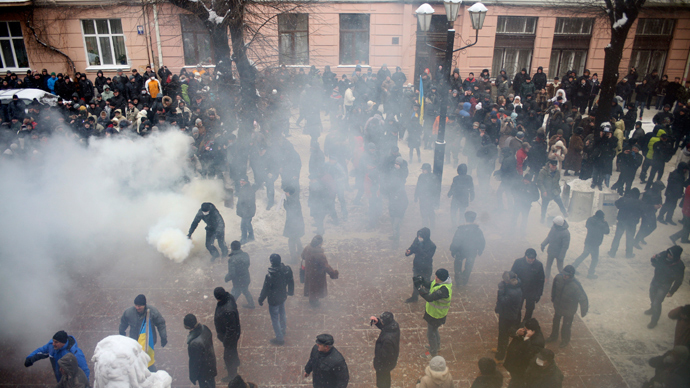 Demonstrators seized the governors’ offices in the cities of Lvov, Ternopil, and Rivne, and administration buildings in Uzhgorod, Lutsk, Khmelnitsky, Zhitomir, and Sumy.